This fall, college chemistry professor Kaitlin Fisher will add a new credential to her résumé — running mentor and coach. 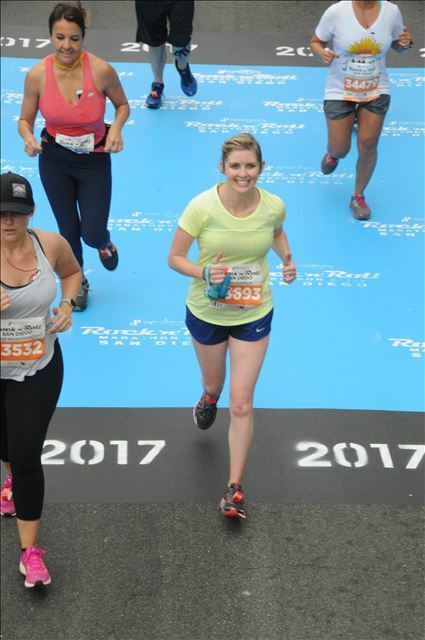 Kaitlin will be helping lead a group in our next 10K and Half Marathon program, a position she never expected. Nearly a year ago, she was intimidated at the thought of joining our first 5K program. For anyone nervous about being a beginner, read Kaitlin's story in her own words. "I had always considered runners to have an innate gift that you have to be born with. Really, it had to be the only reason it was so excruciatingly hard for me to even contemplating running a single mile. My fiancé was a high school and collegiate runner and was always encouraging me to try it. He was convinced that with my competitive streak and my love of challenging myself, it would be a perfect fit and that I would end up loving it. NOPE. Many years went by with sad stop and starts and not a single feeling of good will towards running. He finally talked me into signing up for the couch to 5K training program with Fleet Feet last October. I was legitimately scared. For a few very real reasons. No. 1, I was afraid that I would continue to hate running and have to endlessly suffer. No. 2, I worried that I would embarrass myself with my horrendous form/speed/you name it. And No. 3., I can be shy and was worried, 'would I make friends? Would anyone like me?' Blame it on my nerdy younger years. So I signed up and took the plunge. Here is what happened — it was challenging! When we first started with running intervals of 3-4 minutes, I could not believe how hard it was. And yet, something amazing started to happen. Every week I could feel my legs and my lungs getting stronger. I could FEEL the progress. It was crazy to appreciate my body and what it could do in a completely new way. On top of it, everyone in the group was so kind, generous, and fun that going to workouts became the highlight of my weeks (still are). I made a goal to run my 5K in under 30 min, and I did. Then something really strange happened — I started to like running. Then, I started to love it. I wanted to go farther and faster and see where it led. Lucky for me, the group at Fleet Feet took me in and said, 'you got this, gurl' (I’m paraphrasing). And so I joined the 10K group and finished that one in 58:30 minutes, under my one-hour goal. And with their infinite support and faith in me, I finished my FIRST half marathon in 2:28 this past June. It felt amazing. I genuinely mean this — If I can become a runner, so can anyone. I went from not being able to survive run-walking-hyperventilating a mile to regularly logging 10 and 12 mile runs. It is my new Zen, my new way to relax, and honestly, a new way of life."